Golfers staying in the Pittsburgh area will be delighted to find that this part of Pennsylvania is so rich in golf courses. One for the more experienced of players is the Alcoma Golf Club along Saltsburg Road, which boasts rolling greens and some scenic lakes. 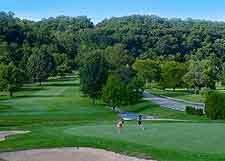 The extremely inexpensive and accommodating Schenley Park Golf Course is especially close to Pittsburgh city center and is actually part of the expansive Schenley Park on Schenley Drive. Many of the golf courses lie on the outskirts of Pittsburgh and close by, with a small selection within the neighboring towns of both Freeport and Oakmont.